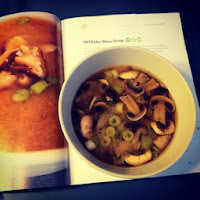 Miso is great for boosting your immune system. What better way to eat it than in a warm bowl of soup! This recipe is taken from the "
" by Lindsay S. Nixon, recipes designed to be on the table in 30 minutes or less. It calls for Shiitake mushrooms, but I rarely have them in the house, so I substitute with regular white mushrooms, and I'll add in some carrots and tofu if I'm not pressed for time. Recipe serves 1 person. Double, triple or quadruple it for more. Line a medium pot with a thin layer of water. Add mushrooms, saute until mushrooms start to soften. Add red pepper flakes and miso, stirring to prevent clumps. Add onions and remaining water, bring to a near-boil. Reduce heat, add more miso or soy sauce if desired and any other extra ingredients. Simmer until everything is cooked and warm.